From Alexandra Petri, one of the smartest, and often funniest, writers at the Washington Post, some (satirical) thoughts about the students now speaking up against the American love affair with guns. Now, if you don’t want to hear from any more high schoolers traumatized by gun violence, then you either decide to try to create a world where high schoolers are not traumatized by gun violence, or decide to create a world where you do not have to listen to the high schoolers. It looks like we’re picking the latter! We are not monsters. This burning shame that keeps us awake is their fault. If they were not there pointing the finger at us — We are being personally victimized! We are the real victims here! They have the audacity to point fingers at people for doing nothing! We haven’t done anything! You can almost hear that coming out of the mouth of some “regressive”1 commentator on one of the talking heads channels in response to the raw and honest reaction coming from the children. What these analysts and spokespeople seem to ignore is that the First Amendment doesn’t specify a minimum age and that the right to petition the government belongs to everyone, not just their friends with big bank accounts. Anyway, I hope that the students from Parkland, now loudly speaking against our absurdly loose gun laws, continue to ignore those calls to shut up and sit down. Even more, I really hope that they, joined by protesting young people from all over the country, have started a movement that can affect major changes. The adults of my generation have created many, many problems with our current government, and American society in general. Problems that are already severely impacting the lives of these kids beyond the almost-daily gun violence. From climate change to economic disparity and poverty to an increasingly unstable world, they need to be more than just aware. Students must be leaders in the work to the solutions. But those solutions will not come easily. I agree with a post from a wise friend who writes that such a process will be “incredibly long” and will include many setbacks. Sustaining the passion for the work is really hard, and you’ll need trusted friends and allies who will listen to you vent and strategize with you and privately call you on your mistakes and tell you when you need to go get some sleep. You will need those people, and I am sure you will be those people for each other as well. Some of those “trusted friends and allies” must be their teachers. However, instead of telling them to stay in the classroom, we must listen to our students, to both their concerns and ideas. We, as in all adults who support children, must help them learn how to use their authentic voices and to effectively direct the power of responsible civic engagement. Guide them into adulthood, instead of always telling them what we think they need to know, what to say, and how to act. 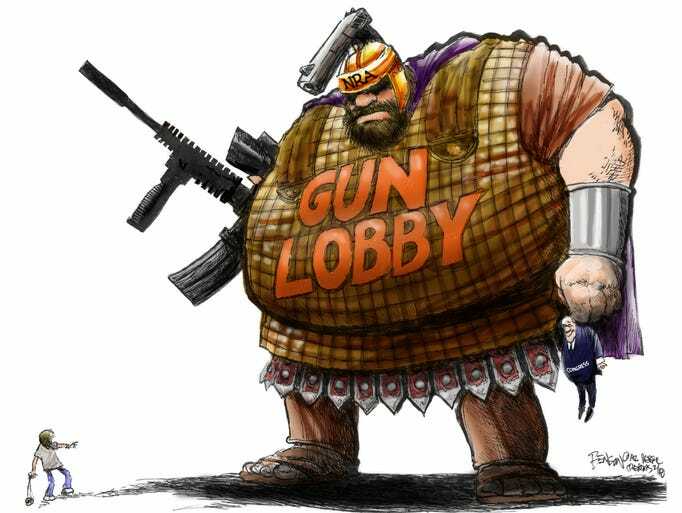 Image is of an editorial cartoon by the wonderful Steve Benson, whose liberal-leaning work always seemed a little out of place at the conservative (but generally responsible) Arizona Republic newspaper (known online as AZCentral). 1. Since “progressive” is often used as an alternate for liberal on the political spectrum, I think we should use a far more accurate synonym for conservative, “regressive”.